Sometimes a ferry ride to the San Juan Islands, for celebratory shopping at the Pelindaba Lavender store, takes the edge off of a grueling 2-hour-a-week blogging hobby. In a magnificently purple and lavender-smelling store in the town of Friday Harbor, I find lots of things I didn’t know I needed before. “Do the awards nominations come with any money?” Nate asks. At home, I spritz the $12 bottle all over the inside of a toilet and swish the solution around with a scrubber. Then, I clean the outside as well. I swear it sparkles and is much happier than it was before. A light, vinegar-lavender scent fills the air. “It’s working! It’s really working!” I tell Nate. Nate is happy for me, but he’s only mildly impressed—even if I miraculously have enough of the bottle left over for the remaining toilets in our house. In the meantime, I’ll savor the lingering lavender magic aroma and thank some fantastic bloggers who have nominated me for awards over the past few months. 1) Suze of Suziland Too or Obsolete Childhood has a lively and fascinating blog. So, I’m honored that she nominated me for the Blogger Appreciation Award around January 23rd and I’m just now getting to my response. (Better late than never, I guess.) Thank you, Suze! I like to find funny and absurd connections between things, people, and situations—and I think that’s a positive thing. For instance, a head of lettuce, by itself, isn’t very funny, but it could be if it were put into a ridiculous situation, such as the middle of a street—because no one is expecting a head of lettuce smack dab in the middle of the street. This absurd situation tells a story in a way. For example: What if I’m the person who lost her lettuce—just dropped it in the middle of the street and forgot to pick it up again? I’d probably go back and get it and try to make a salad anyway because, in my mind, it might have only been there for about five seconds and the truck that hit it could have just gone through the car wash first and I could just salvage the “prettier” pieces—and wash them really, really well in hot water, which would then wilt the lettuce, but I’d just tell people I did this on purpose— “tenderizing” it for flavor and “complexity.” It might not be a tasty or attractive salad. It definitely would not be “sanitary”—in the classic sense of the word, but it would be hilarious, which is the whole point of making a salad, right? –Why did you start blogging? a) If I ever needed to fix a leak or install a chin-up bar on my own, and Nate wasn’t around, I could do it on my own, by referencing the blog online. b) If Alex ever moves out of our house someday and he wants my “best” recipes, they’re online! –What is your favorite book? I found The Possibility of Everything by Hope Edelman fascinating. I also love the “happiness” books by Gretchen Rubin. They make me happy. –What do you dislike the most? –What is your favorite pastime? Alex just got his braces off and his orthodontist told him to chew gum constantly to help with his new bite. So, we bought a bunch of gum and I’ve re-discovered a pastime of chewing gum. It’s a lot of fun to do and it distracts me in a good way when I’m driving. Instead of thinking about all of the accidents I could get into while driving, I’m thinking about the fun, minty taste in my mouth. –What are things you are most grateful for? Most recently, I’m grateful for lavender-infused natural cleaning products and I think the bathroom is appreciative as well. However, I’m most grateful for my husband and son. I love them so much and I treasure the time I have with them on this earth. They are a joy. We’re also very fortunate to now live in a state where we can visit both mountains and the ocean—a dream come true. Alex captures a photo of me on Friday Harbor. –What is the story behind your blog’s title? I wanted to find a name that “communicated” the kinds of DIY projects I’d do—from cooking to home repair. 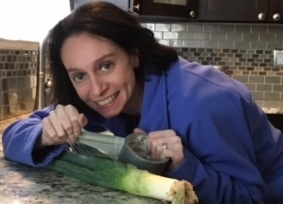 I also wanted to find a unique name that WordPress didn’t have yet for a domain site and when I typed in the name “Fixin’leaksandleeks” it was the only one that came up. Posing for my picture was the next task and I thought that duct taping an actual leek would be funny, but I couldn’t do a “selfie” (because my hands were busy) and Alex, I think, takes good pictures of me, so my “signature photo” on the blog was captured by Alex. Thank you, Alex!!! –What is a food you can’t live without? Pizza!!!! I make it from scratch once a week. –How has blogging changed your life? I’ve found so much support from the blogging community. It’s incredible how encouraging other bloggers are. –What are three random facts about you? I drink a can of Coca-Cola every morning. I absolutely love aqua aerobics and I’ve been taking classes at my local LA Fitness since January. When eating lunch during the week, I either watch a telenovela in Spanish or a cooking show. –What do you hope to accomplish in 2018? –What is the most favorite place you’ve visited? Our best family trip was to England in 2011 or 2012? We went to London, York, and the Lake District. –How did you meet your best friend? Nate is my best friend. We met at a Catholic young adult’s group in Columbus, Ohio called “The Twenty Something Group.” Nate was giving a presentation on poverty in the Fiji Islands, where he served as a Peace Corps member. I found the presentation—and Nate—fascinating. He organized a hiking trip and I was the only woman in the group who went, so I got to know Nate better. Over time, we got engaged and married. –Do you think you’re creative? –Do you believe there’s someone out there for everyone? I do. I also believe in Orcas. One is waiting for me to see it and photograph it perfectly for my blog, Facebook, Twitter, and Instagram. I just know it. I made long lists of worthy nominees before on the following blog posts: I’m a Black Cat Blue Sea Award Winner, The Cranberries Runneth Over, and Mystery Blogger Award. So, I’m trying to nominate new people as I go along—and I’m trying to keep in mind that some people don’t want to be nominated for awards. If your name/blog appears on the list below—and you don’t want to accept awards—please accept my apologies. It is not a requirement to accept any of the awards above or answer any of the questions. Cheers! Your Turn: What’s your favorite way to preserve important memories/traditions? Quick Update: Nisha at InspiresN has a new website address: inspiresn.com I went ahead and corrected that link in the body of the text for this post and I’ve placed it here as well. Cheers, Nisha! I too long to see an Orca. Great response and congratulations! Thanks! I’m so glad I’m not the only one who has not seen an Orca. Someday. Someday I will. It’s beautiful! We always go in the off-season, so the weather isn’t great, but it’s still wonderful–and all of the restaurants serve delicious food. Oh good to know! It’s been on my list for years now! I’m glad you mentioned it so it brought it back to mind! I know, right? The problem is: the scent doesn’t last long. I’m trying to figure out how to make my own, but I have to check and see if lavender is safe for cats before I clean the entire house with it. Good point! I hadn’t thought of that! I know lilies, all lilies, are toxic. Thanks for the Nomination, Cecelia! It’s so sweet of you. I will contemplate the question on Memories/Traditions. I have to say that while I skim many blogs in the course of pursuing my own Path through blogdom and business, there are only a few that I stop long enough to read completely. Yours is one of those. You always make me smile, and sometimes you make me laugh out loud (good thing my office is at the opposite end of the house from everyone else). You are welcome–and thanks so much for reading! I’m really enjoying your blog as well–it’s chock full of interesting and beautiful things everywhere I look. Cheers! Journals are a great way to preserve memories–in original handwriting–nice! Congratulations on your win, and thanks for the nomination 😊. Congratulations, well deserved !! Thank you for participating in the award and you have a great blog as well Wonderful to read your answers and know more about you, Thank you for the mention about inspiresN. By the way , my site has moved to the new hosted server at inspiresn.com from inspiresn.wordpress.com today and so the old site may not be accesible. You are very welcome! It would be great if you can replace the link with the new one ,I don’t think it redirects as of now. Thanks for your help! Done–and I just visited your new site–it looks great! wonderful, Thank you so much, glad to heat that! Lavender water is wonderful stuff! I just love it. And, as far as being really good at DIY projects, I’m sooo not. The projects are an excuse to write more often, which is an activity I really enjoy. Cheers!